With Hive's newest plans, you can send unlimited email for a flat rate. Find out more here. 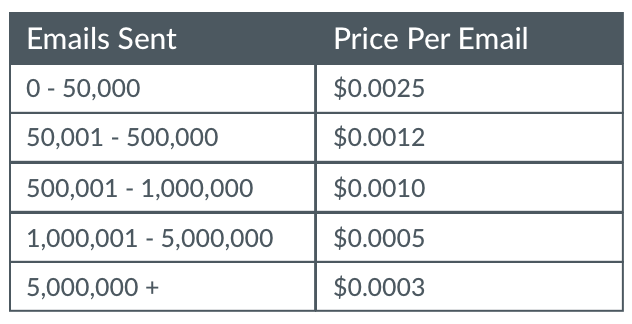 If you're on a legacy plan, Hive's email pricing is pay-as-you-go. The number of emails sent in a particular month dictates the price per email. For example, if you send 20,000 emails next month, you'll be billed $50 for the month (20,000 x $0.0025 = $50). This fee is added to your monthly subscription fee. If you're on a legacy plan and are interested in switching to a new plan to send unlimited email, get in touch with us at email@hive.co!